As you all well know, I am currently the Chow writer for the Tucson Weekly and have been for about two years. I really hope I am for a long time to come. 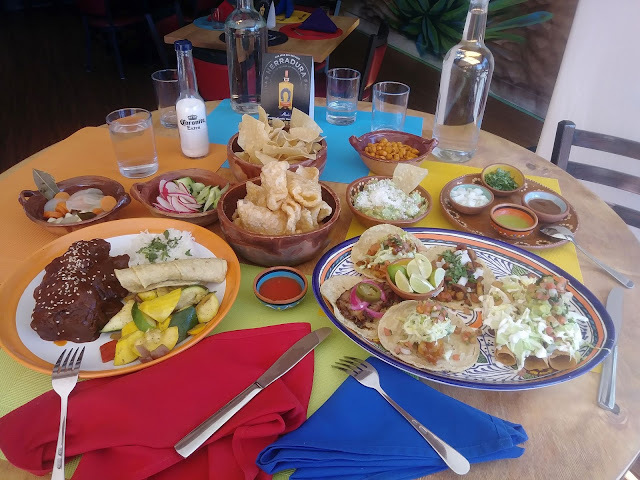 It's so much fun and it allows me to explore even the further culinary territories of Tucson and beyond a whole lot more than this here silly blog does. Thing is, sometimes articles I write get the ax for one reason or the other. Its rare, but....it does happen. A recent one that never saw the light of big time print was one on Abuela's. Now, if you recall, Abuela's moved into the Old Pueblo Grille space a while ago and was wrought with problems from the get go. Then, after they finally open, the restaurant starts hemorrhaging money, so much in fact that they had to close their doors not even three months of being in business. With the approval of the Abuela's family I decided to post my never published article on the blog here so you can read/see what could have been in the Weekly a few weeks ago. Lucky for me, and the Weekly, that it was never published because there are two big mistakes I made fact wise so I cleared those up. You'll see. Another odd factor in the moribund of the feature was that every picture I took with my awesome digital camera did not come out or make it to the memory card. It was the weirdest thing ever. Not. One. Picture. After the photoshoot I went home to upload and edit and, yeah...my camera was empty. How does that happen? So the pictures I submitted and uploaded here are from my phone. So bizarre. Anyway, with that said check it out. Thanks to food channels and reality TV, we kind of have an idea of how difficult it is to open a restaurant. But not really. The hard truth about it all is that the process of moving into a location that has been around since the ‘50s and hosted a very popular restaurant for several decades means that expectations are going to be high. The Old Pueblo Grille was a Tucson staple with one of the best patios in southern Arizona, and decent southwest inspired fare, but when it fell to bankruptcy and closed in May of 2015, people wondered what would become of the 8,000+ square foot property on Alvernon and Broadway that was originally built as a house. Not too long after the closure, the owners of Brother John’s BBQ, John and David Aldecoa, bought the property with a longtime friend, Jorge Alvarez, and decided to turn the well-loved and well-worn eatery into a homey Mexican spot with traditional dishes from old family recipes. (Correction! They actually never bought the property, it was still owned by HSL Properties, so good thing this didn't get published) Going with the name Abuela’s, seeing as Jorge’s mother, Georgina, has gotten involved providing not only traditional family recipes but techniques handed down from generations, they were on their way to filling in some big culinary and time-honored shoes. So, the name has been established, the dishes were being developed, staff is being hired and trained, then, boom. Abuela’s hit some major snags. The building had to be rezoned, the kitchen had to be updated to get to code, the patio had to be redone, the liquor license was in dispute; all of this time consuming and very, very expensive. When Abuela’s finally opened, about two years after their announcement and occupation of the space, the wait and hype had gone on to such a degree that, as mentioned before, expectations were through the roof. People immediately began to pile into the open and refurbished Abuela’s, now decorated with whimsical day of the dead skulls from a local artist, hungry for a dining experience they had been waiting months and months for. And that’s when things kind of fell apart. Opening an ambitious restaurant with a pared down menu helmed by staff that wasn’t quite prepared for the initial rush, online comments ranged from the mildly understanding to the downright harsh. This is why smart owners, such as the Aldecoa’s, do ‘soft openings’ to buff out the kinks and see what works and what isn’t before nakedly diving into a grand opening with the dreaded ‘no going back now’ promise of restaurant ownership. 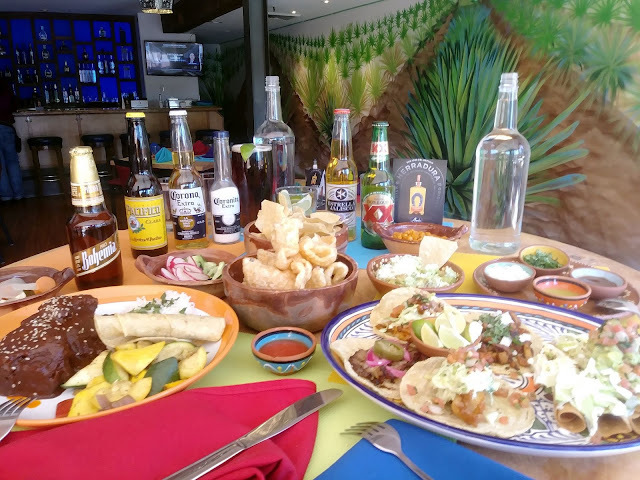 Now that they are getting their rhythm, Abuela’s is beginning to find their groove and patrons are becoming less knee jerk critical, relaxing a bit to discover the finesse in the food and admire what they have done with the 50+ year old casa. On a personal level, I have enjoyed Abuela’s since it opened. The interior is both modern and historic with an artistic flair that is just enough pop on the eye to not be glaring or obvious giving it a warm, lively atmosphere. Colorful frescos and murals dot the updated bar area along with a back lit liquor cabinet stocked with top shelf booze and an impressive tequila list. What impressed further, and even astounded a little, is the fact that Herradura Tequila makes a silver blend (Correction! It was a reposado tequila and, again, good thing this never saw big time print) just for Abuela’s. It is a smooth if not slightly smoky addition to their delicious margaritas, but I prefer to just have a shot of it with an ice-cold beer. Maybe its because I have never been there on a Friday or Saturday night, but the service has always been attentive. For that I may be guilty of being a bit too forgiving but, for me anyway, the food is what makes me a fan of Abuela’s. There is really nothing more pleasant than handmade tortillas to go with a rich and flavorful mole that smothers a perfectly smoked cut of brisket provided by Brother John’s. The run of tacos, especially the smoked pork belly or the beer battered cod, are on one hand downtown crafty mingled with an old-world flourish in taste and texture. The rice is wonderfully prepared, and I always appreciate a rustic and lightly seasoned calabacitas because that’s how a true abuela would prepare it for her family having faith in the quality ingredients. Most large scale Mexican restaurants typically have menus that are daunting in size, not just physically but option wise. Abuela’s menu is delightfully frugal focusing on the few things they do right rather than too much to impress and perplex. When they survive the summer (Oops! ), this place will become a dining destination now that the worst part is over, and I predict the best is yet to come.